IK Multimedia has announced iRig Acoustic Stage - the first advanced microphone, preamp and digital processor system that provides an exceptional true acoustic tone, anywhere. iRig Acoustic Stage combines an advanced MEMS microphone that clips on to the sound hole of an acoustic instrument with a preamp and DSP unit that captures all the tone, vibe and "air" of the instrument when playing live or recording in home and project studios. The synergy between its components and the advanced signal processing makes iRig Acoustic Stage a revolutionary solution for accurately reproducing - and improving - the sound of all types of acoustic guitars and other instruments, in any situation, with studio-grade performance, advanced features, ease of installation and a convenience never seen before in any competing product. iRig Acoustic Stage's patented system makes any acoustic guitar or other acoustic instruments like ukulele, acoustic bass, bouzouki, mandolin, etc., sound exactly as if they were captured with a classic recording studio setup, providing a full rich studio-quality sound on stage and in the studio. Players simply clip the iRig Acoustic Stage's microphone to the sound hole, attach it to the iRig Acoustic Stage pre-amplifier and digital processor, then connect its output to a mixer or acoustic guitar amplifier. iRig Acoustic Stage uses an ultra-compact MEMS microphone to capture the acoustic's sound from the guitar's sound hole. It can be quickly slid into place or removed from the sound hole of the instrument with zero modification to the instrument required. This lets players use iRig Acoustic Stage on all of their acoustics during performance. The magic of iRig Acoustic Stage comes from the combination of the microphone, the preamp and its digital signal processing unit. 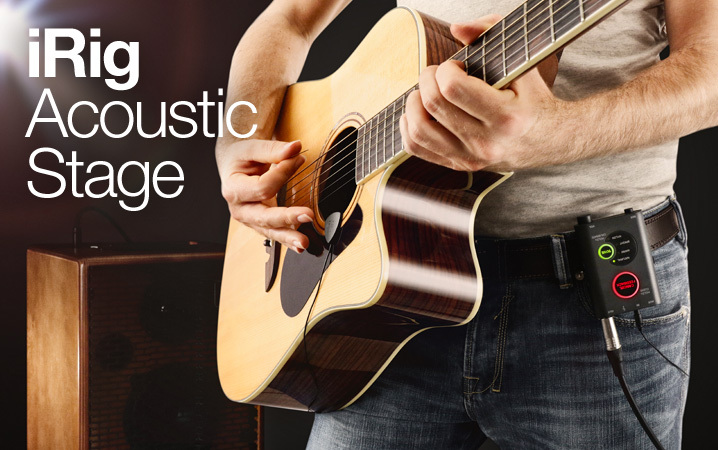 iRig Acoustic Stage analyses the incoming signal from the guitar - both the overall sound and nuance of the instrument AND the playing technique - and builds the optimum tone profile for the instrument that delivers a warm, round and balanced acoustic sound. The tone profile can then be enhanced through the use of 6 selectable tone presets, depending upon the playing situation. iRig Acoustic Stage provides 3 presets for steel string instruments - natural, warm, bright - and the same 3 optimised for nylon string instruments. Playing an acoustic on stage in a live setting will almost always generate some type of acoustic feedback or-hard-to-control resonances. iRig Acoustic Stage features a built-in digital feedback suppression algorithm - a handy easy-access feature on the preamp/DSP unit that quickly eliminates the offending frequencies from the live sound with the press of an oversize button. iRig Acoustic Stage also features an AUX input with a mix knob. This input is designed for use with an acoustic electric's onboard piezo or magnetic pickup. The AUX input allows players to utilise the piezo pickup system and blend in just the right amount of microphone signal. There's also a phase inversion switch that lets users swap the phase of the microphone or AUX signal to provide the best possible sound from all guitars.